Is it last call at Paddy’s Pub? Has the It’s Always Sunny in Philadelphia TV show been cancelled or renewed for a 13th season on FXX? The television vulture is watching all the latest cancellation and renewal news, so this page is the place to track the status of It’s Always Sunny in Philadelphia season two. Bookmark it, or subscribe for the latest updates. Remember, the television vulture is watching your shows. Are you? Airing on the FXX cable channel, It’s Always Sunny in Philadelphia revolves around five underachievers who run Paddy’s Pub in South Philadelphia — Mac (Rob McElhenney), Dennis (Glenn Howerton), Charlie (Charlie Day), Dee (Kaitlin Olson), and Frank (Danny DeVito). In season 12, the gang’s adventures include going to a waterpark, dealing with a Wolf Cola PR nightmare, and actually spending a whole day tending bar. The 12th season of It’s Always Sunny in Philadelphia averaged a 0.36 rating in the 18-49 demographic and 601,000 viewers. Compared to the season 11, that’s up by 9% in the demo and up by 11% in viewership. Find out how It’s Always Sunny stacks up against the other scripted FXX TV shows. On April 1, 2016, FXX renewed It’s Always Sunny in Philadelphia for season 13 and season 14, as well. Season 13 debuts September 5, 2018. Stay tuned for further updates. 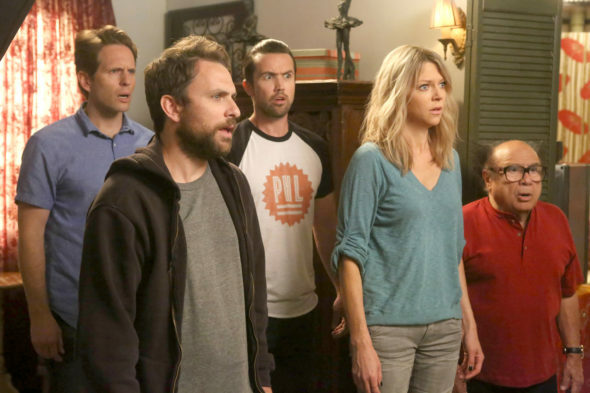 Despite low ratings, It’s Always Sunny in Philadelphia continues to be renewed. While the FXX won’t cancel this sitcom before the end of season 14, I’ll still keep an eye on the ratings. Sometimes, when shows really tank, networks reverse their renewal decisions. Considering the current ratings, I don’t see that happening. What do you think? Do you think the It’s Always Sunny in Philadelphia TV show will be renewed beyond seasons 13 and 14? When should this FXX comedy series end? I like that show…it takes me away from all my problems puts me in a fantasy world. Can you at least run re-runs ? Almost forgot what it was about. love the show. WAAAAYYY too much time in between seasons.